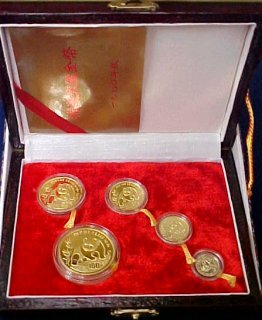 1990 China Panda gold Proof set PR69 Ultra Cameo (NGC).... A very rare set with a mintage of only 5,000 total sets. The 1oz, 1/2oz, 1/4oz. and 1/10oz. graded Proof 69 Ultra Cameo and the 1/20oz. as PR68 Ultra Cameo. The set comes with its original box and certificate of authenticity as issued from The China Mint.